The Year of Open Doors: One Year On… | Scots Whay Hae! 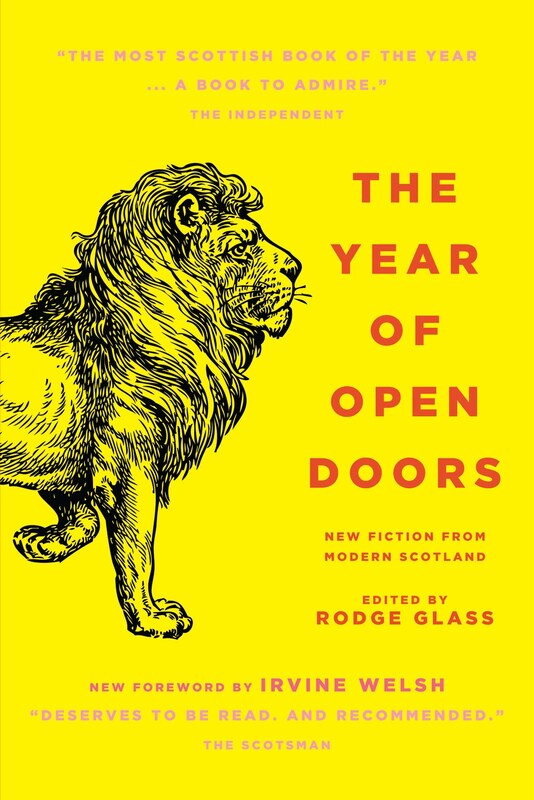 Tomorrow night at 7pm at The Arches in Glasgow (Wed 27/7), there is the launch of the paperback edition of The Year of Open Doors. For those who don’t know it is a collection of short stories by Scottish writers both well kent and new which was first published by Cargo last year. It became one of the most important, and inspirational, publications of recent times and seemed to not only capture the mood of contemporary Scottish literature, but help set it. The above quote is one of my favourites and comes from the 1996 short story collection ‘Children of Albion Rovers’. It is the way I feel about many novels, and neatly sums up why I have such a love for the short story. There is no sense of writer’s fulfilling a word count, or just filling. Some of Scotland’s greatest writers’ best work has been in short story form. Ali Smith, Anne Donovan, A.L. Kennedy, Alasdair Gray and Agnes Owens all have one or more collections that are must reads, and that’s just the ‘A’s. I still insist that James Kelman’s best work is to be found in his short story collections, yet some readers appear to view them as if they are a ‘lesser’ form, something writers do to fill time in between novels. Those people are wrong. ‘The Year of Open Doors’ is a new short story collection from Cargo Publishing. It features writers with varying degrees of profile and publications and it follows in a fine tradition of collecting some of the best contemporary writers’ work in one place. The aforementioned Kelman, Gray and Owens found a larger audience through the 1985 collection ‘Lean Tales’, but the inspiration for this anthology appears to be ‘Children of Albion Rovers’, the 1996 book that brought together, amongst others, Alan Warner, Gordon Legge and Irvine Welsh. There have been various Scottish short story collections published over the years, most notably by University of Glasgow’s MLitt in Creative Writing and the New Scottish Writing anthologies. While these are always worthwhile they never seem to reach a wider audience. This is a situation that Cargo, a new and innovative independent publishing company, seem determined to change. There are a few links with ‘Children of Albion Rovers’ that give clues as to that book’s influence. Irvine Welsh has written the foreword, and there is a contribution from his contemporary Duncan Maclean, who is the writer of ‘Blackden’, one of Scotland’s great lost novels, and ‘Bunker Man’, just one of Scotland’s great novels. He’s better known these days as a playwright so it is great to have him back writing prose. It’s like having one of your favourite bands release something new. But his importance to Scottish writing is greater than just fiction. He was central to the formation of Clocktower Press, which was the forerunner of Rebel Inc, publisher of ‘Trainspotting’ and, yes, ‘Children of Albion Rovers’. Many of the Scottish writers whose work has been discussed in ‘Indelible Ink’ may not have been heard of without McLean and his compatriots’ determination to publish and be damned. This is the spirit that drives ‘The Year of Open Doors’. There are a few other well known writers involved. Alan Bissett, author of this month’s featured novel ‘Boyracers’, Kevin MacNeil who you may know from his 2005 novel ‘The Stornoway Way’, and Suhayl Saadi whose 2004 novel ‘Psychoraag’ will feature on these pages in the near future. But this anthology’s greatest strength lies in the lesser known contributors who make up the majority of the book. Names such as Jason Donald, Ryan Van Winkle, Anneliese Mackintosh, Kabka Kassabova and Daibhidh Martin will only be known to a few, but the discovery of the new is always exciting, and this is a collection of real quality throughout. The role of independent publishers is increasingly important. I think that where the music industry has lead, publishing and literature will have to follow. Just as the major record companies realised that they could make money with little effort by repackaging acts that were already established, so the few bookshop chains that are left feel that they can do similar. In that sense Dan Brown is literature’s Phil Collins. No one comes out well from that comparison. But new music survives and thrives. In fact there is more good music out there now than at any other time, and access to it has never been better. Short story anthologies remind me of the free compilation CD’s that come with music magazines, or record companies’ samplers. You can discover the new, become reacquainted with the more familiar, and perhaps only listen to some tracks once. They are important as a taster as to what is out there and there is always the chance that you’ll discover a new voice that makes a difference to your life. Such a chance is always worth taking. This collection should be seen as an opportunity, an example and perhaps even a test case. If ‘The Year of Open Doors’ is a success then it is to be hoped that others will follow, that publishers will take chances on these writers and others, but also that it inspires writers to do it for themselves. There is an audience out there for new fiction, it is a matter of making that audience aware of where to find it. Marshall McLuhan’s famous claim that ‘the medium is the message’ has never been more relevant. This is something that those involved with ‘The Year of Open Doors’ understand. As well as the book there is an audiobook created in conjunction with Chemical Underground, podcasts, live events, video blogs, downloads and an attempt to form a real artistic community. But this is not just a one way relationship. Both writers and readers have to adapt and change to find each other. Buy two copies, and give one to someone you care for. There’s a lot at stake here.